Thomas Renyi’s education at Rutgers turned out to be a great business decision: his five-year, two-degree investment yielded 40 years of distinction in the banking industry, culminating in his position as chief executive officer of The Bank of New York. Renyi’s generosity to Rutgers over many years guarantees dividends well into the future for current and future faculty and students. In his most recent gift, he established the Thomas A. Renyi Endowed Chair in Banking with a $2 million donation to Rutgers Business School—Newark and New Brunswick (RBS). The endowment provides RBS steady financial support in perpetuity while the chair attracts and retains the most distinguished faculty in the field of banking. Renyi began his career at The Bank of New York in 1971 as a credit officer. During his tenure with the bank, his assignments included launching a capital markets trading operation and supervising the integration of two multibillion-dollar mergers. In addition to a master of business administration degree from RBS, which he received in 1969, Renyi earned his undergraduate degree in 1968 from Rutgers College. 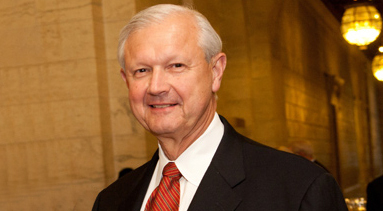 He is a member of the RBS Board of Advisers and the Rutgers Foundation Board of Overseers and a past member of the Rutgers Board of Governors and the Rutgers Board of Trustees.